Hi good morning guys: today we are doing another hair butter. To have your hair looking at its best you need to constantly take care of it. One of the ways to do so is with a hair butter. Today’s recipe is for a Rosemary, Mango and Melon Hair Butter. This recipe contains rosemary that is believed to stimulate hair growth. So if you are looking for a hair butter that will give you a long luxurious looking hair; try these. It uses a shea olive cream base which moisturizes and keeps the scalp and hair healthy. This base contains Shea butter and olive oi that works as an emollient for your scalp. Next, we added mango butter and rosemary essential oil. 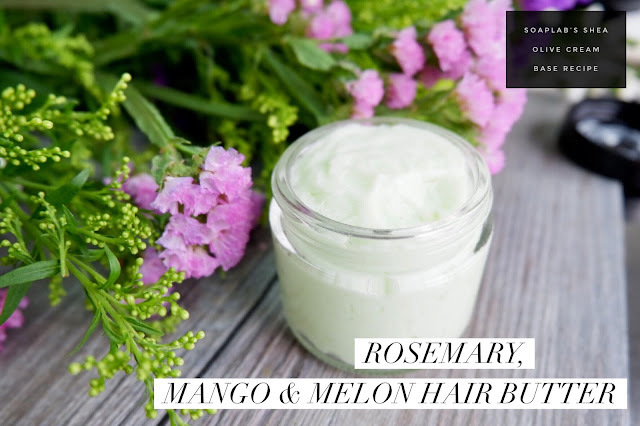 Mango butter has high levels of vitamins and antioxidants and creates an optimum environment for hair growth. Rosemary essential oil stimulates hair growth so this will give you the ‘long hair’. For a fruity and flowery scent add melon jasmine fragrance oil before adding green liquid pigment for colour. Using a pipette, add in 1.5g of Rosemary Essential Oil into the mixing container. Next, also using a pipette, add in Melon Jasmine Fragrance Oil. Add in a drop of Green Liquid Colour Pigment to add a hint of green to the hair butter. Fill hair conditioner until it reaches the brim of the jar. Do not overfill as it will spill and overflow when you screw your cap on.